Magnetic resonance imaging devices are one of the most fantastically incredible machines humans have ever built. They’re capable of producing three-dimensional images of living tissue by flipping protons around with a magnetic field. Ninety percent of the population doesn’t know what that sentence means, yet you can find an MRI machine inside nearly any reasonably equipped hospital in America. For his Hackaday Prize entry, [Peter Jansen] is building a magnetic resonance imager, capable of producing the same type of images you’d get from the radiology department at a hospital. It’s going to be a desktop unit, capable of scanning fruit and other similarly sized objects, and can be built using tools no more advanced than a hot air gun and a laser cutter. This project is a continuation of what should have been [Peter]’s Hackaday Prize entry last year. Things got busy for him last summer, he dropped out of the Hackaday Prize, which means he’s welcome to continue his build this year. Last year, [Peter] developed the plywood mechanism that would rotate a magnetic sensor across the diameter of the scanning volume, rotate the object to be scanned, and lift the object through the volume. It’s a weird 3-axis CNC machine, basically, but the parts near the magnetic sensor can’t be made out of metal. Dental floss worked okay, but we have a few hundred feet of Spectra fishing line if we ever bump into [Peter]. Magnetic resonance imaging means big coils of wire, too, which means the tedious task of winding coils around a cylinder is part of the build. [Peter] built a machine to do the work for him. This is not [Peter]’s first attempt at building an imaging device. He built a desktop CT scanner that is exceptionally slow, but does shoot radiation through fruit to produce an image. His first project on Hackaday.io was the Open Source Science Tricorder, one of the top five finalists in the first year of the Hackaday Prize. Already, [Peter] has some amazing work under his belt that produces real data that could not be otherwise obtained. An Open Source MRI is the perfect project for the Hackaday Prize’s Citizen Science phase, and we’re very happy to see him enter this project. It’s been a bit dusty lately in Seattle’s Metrix Create:Space. That’s because they’ve taken on their biggest project yet — a full scale replica of an MRI machine for university research. [Tom Grabowski], a professor of Radiology & Neurology at the University of Washington, needed a replica MRI machine. This is because time on real MRI machines is very expensive, and when performing research on Autism, it is important to get the test subjects used to the process before using the real deal. He originally turned to the Center for Human Development and Disability, also at the University of Washington, but the project was just simply too big for their facilities. He did however get to meet a fellow researcher named [Fritz] who then contacted Metrix to see if it was possible, and like any good hackers, the members of the space were more than up for the challenge. The replica MRI machine is made out 2″ thick, 4′ by 8′ foam insulation sheets, which is the maximum size their router can handle. Not having made use of the 3D z-cutting capabilities before, they had a bit of learning to do, but as you can see from the pictures, it worked out quite well. 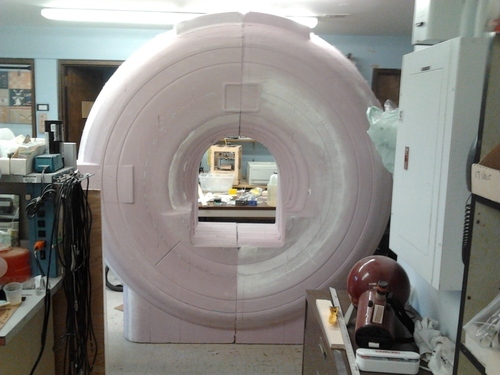 Over a few weeks they were able to construct the general shape of the MRI machine, and finish the surface nicely — it’s far from complete though, as they might even be adding lights and other features to make it one heck of a replica. It’s a great project, and those who have helped are happy to do so as the replica will benefit not only [Tom] but many other researchers at UW — for science, yeah!